Have you ever heard about MOOCs? Do you know what this acronym even stands for? MOOCs are Massive Open Online Courses. They are one of the biggest EdTech innovations of the last decade. They took the world by storm at the beginning of the 2010s, presented as an idea that would revolutionize education. Almost ten years later, our expectations for MOOCs are much more realistic. 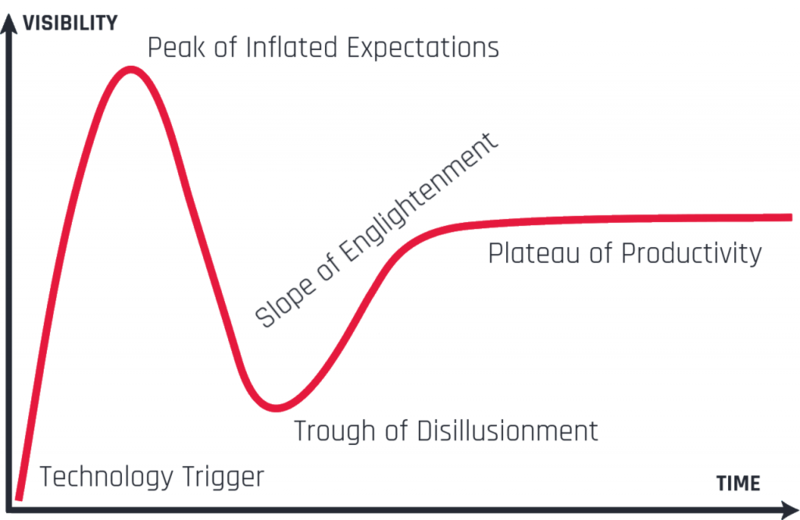 The process of disappointment and frustration and a perceived lack of success with certain emerging technologies is best described by a thing called a hype cycle. The same thing has happened to MOOCs. Their modern version was first introduced in 2006 and quickly became the next big thing. In 2012 the mass media was talking about it being ‘The Year of the MOOC’ as the concept was at its peak of expectations. As you can see on the hype cycle graph above, after the peak of inflated expectations, the period of disillusionment quickly follows. Many called MOOCs dead, a failure and a waste of resources. It’s a classic example of the hype cycle. And as with every hype cycle MOOCs are now climbing the slope and proving that they’re absolutely still alive. Even though I have mentioned that modern version of MOOCs was introduced around 2006, the precursors of distance learning, such as correspondence courses, started in the middle of the 19th century. They were followed by radio courses in the 1920s and TV courses in the second half of the 20th century. As you can see – the idea of distance learning is definitely not new. The modern version of MOOCs however, was introduced in 2006, even though the name MOOC was coined two years later by Dave Cormier of the University of Prince Edward Island. It quickly became the hottest trend in the EdTech world, getting a lot of attention from media and politicians all over the world. Massive Open Online Course – what does it mean? The idea behind MOOCs was to reach a number of students that would be physically impossible to reach with a traditional course. The most popular MOOCs were enrolling hundreds of thousands of participants, while the average attracted dozens of thousands of students. But the massiveness of MOOC is not only in the sheer number of participants. The most important factor is the scalability of the whole project. With a MOOC, there is technically no limits to the number of participants. The marginal cost of adding another student is so small that it can be ignored. This possibility of educating a limitless number of people attracted a lot of attention from governments and the education world. It can be a way of reaching a huge number of people with relatively no additional costs. This one is almost self-explanatory. The participation in MOOCs is usually open to anyone with an internet access. The initial idea behind MOOCs was to offer the courses for free but now it’s not a standard anymore. Some of MOOC platforms charge for some of their features, e.g. certification. Openness of MOOCs is also about the use of resources but it varies between different types of MOOCs. cMOOCs (explained below) tend to be open when it comes to giving permission to build courses on its platforms, while more traditional xMOOCs are often more exclusive and reserve a right to decide which institutions can build the courses. In the beginning, MOOCs were designed as fully online products. However, new types of MOOCs are used together with on-site learning activities. Some MOOC platforms also hold in-person testing and certification events, thus breaking the full online factor of MOOCs. This component distinguishes MOOCs from a lot of different online, open source educational platforms. Learning materials in MOOCs are formed as full courses, not separate, individual lectures. The natural consequence of such a design is that most of the time MOOCs are offering badges and certificates after the completion of the course. Over the years, several concepts of MOOC have emerged. The most prominent ones are cMOOCs and xMOOCs. But what exactly are they and what’s the main difference between them? xMOOCs stands for extended MOOCs. It is a more traditional approach. The structure is pretty similar to the regular university course, with one instructor and plenty of students. Extended MOOCs are sometimes criticized for the lack of cooperation between participants and a rather archaic method of teaching dressed up as something modern. On the other hand, cMOOC stands for connectivist MOOC. They are based on the principles of connectivist pedagogy. What this means in practice is that in cMOOCs all participants are considered learners AND teachers. There’s not a single person who’s considered an instructor. In cMOOCs participants are expected to learn together in a group. This way of learning boosts cooperation between participants. There are several big companies running MOOC platforms. The biggest one is Coursera, with an estimated revenue for 2018 of 140 million dollars.  It provides over 3100 active courses. As a whole, the market of MOOCs has reached over 100 million students. 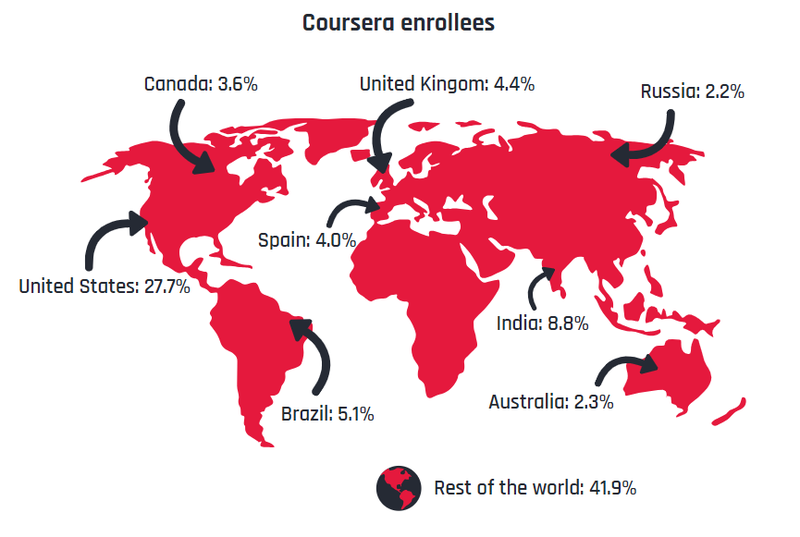 The map below shows that almost half of Coursera enrollees come from English-speaking countries. 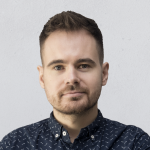 This is one of the issues facing the industry – while content in English is reaching record numbers, it’s still rather small in smaller national languages. In this way the premise of openness of MOOCs is very limited. MOOC platforms are run by (or together with) more than 900 Universities across the globe. These numbers wouldn’t have been achievable without a huge and diverse catalogue of courses. Right now the number of offered courses reaches almost 12 000 and what’s more important – more courses are coming every year. We are at the moment when there are 2000 new courses getting added every year. This shows that the rumors about MOOCs being dead are clearly premature. 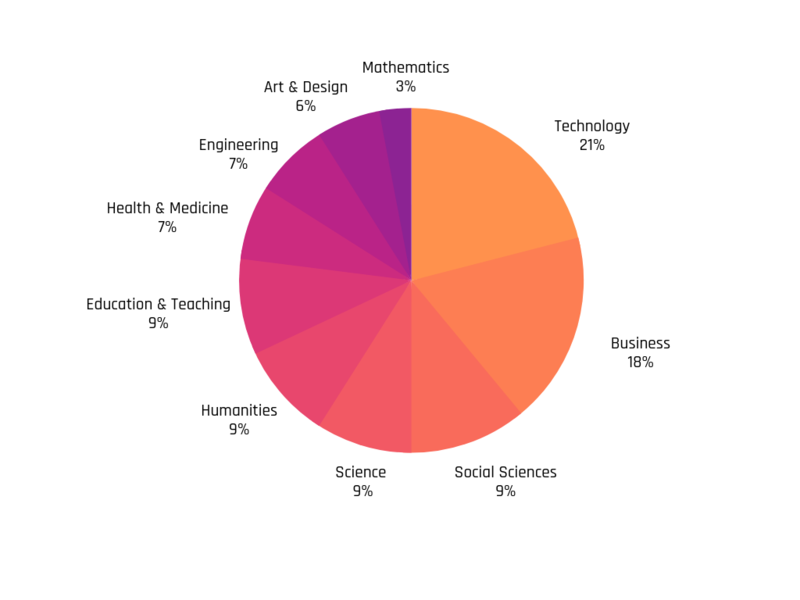 As for the course distribution by subject goes – technology and business are clearly the most common types of courses available, with 21% and 18% of all courses offered. But with time, the offering has become much more diverse, with a strong offering from all fields of education. Massive Open Online Courses are one of the biggest tools right now on the EdTech market. They are a great representation of what every emerging technology goes through – the hype cycle. It’s extremely important to keep the hype cycle in mind when developing your digital product. The different stages of the hype cycle of the technology you’re investing in imposes different strategies for how to deal with your project. You can’t deal with a technology at the peak of inflated expectations the same way as with a tool that is already on the plateau of productivity. Last but not least, MOOCs provide enormous possibilities for education. They show how technology can disrupt and revolutionize learning and teaching processes. And even though MOOCs face their fair share of challenges, they’re still providing great business opportunities. Are you planning to build your own MOOC platform? Design Sprints are a great way to kick-off your project!